Skype is one of the best ways to reach out to people for free or cheap. From your desktop or laptop you can enjoy free VoIP or Videos calls between Skype members. You can even get into group video calling. But what if you find yourself without a computer? 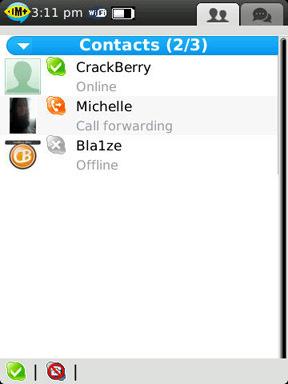 Armed with your BlackBerry, you can still keep in contact by using the IM+ Talk application. Through IM+ talk, you unlock some of the features that make Skype so useful. Free and Cheap VoIP calls, instant messaging and file sharing between members; you are never too far away from those important to you (whether you can admit they are or not). Let’s check out what IM+ Talk has to offer. IM+ Talk was developed by SHAPE Services, the same brains behind the fully loaded IM+ Pro all in one messenger, as well as Photo Translator (translate text captured in images), GPSed Pro (gps tracking and image pinning) and RDM+ (remotely access your computer from your BlackBerry). 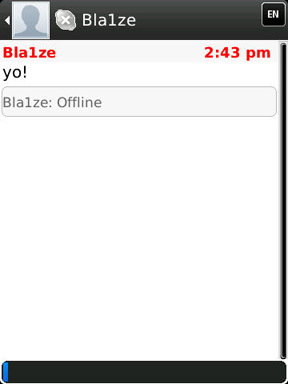 IM+ talk can be used with BlackBerry smartphones running OS 4.3 or higher. At the time of this review, the most recent version of IM+ Talk is 4.4. 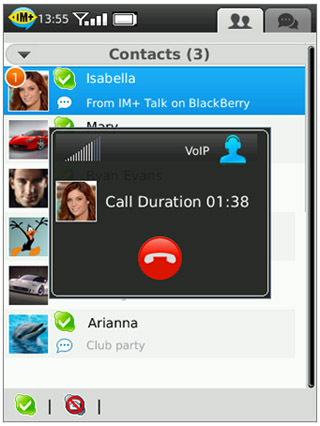 The IM+ Talk UI is identical to the one used by IM+ Pro. Both display the time, battery level and connectivity status (Wi-Fi and Carrier) at the top. One tab will list your contacts and the other tab keeps track of your recent conversations. From the menu, users will be able to add contacts, so long as they are using Skype, SkypeOut or MySpace (are there any MySpace users anymore?). This can be a bit of a hassle if you typically use email addresses to add contacts through Skype directly. Now while you cannot make any necessary changes, such as grouping contacts or renaming them, you can see (very) basic information about a contact, including their ID status and which group you have assigned them to. From the main menu, you can see their avatar and status. In fact, their status is also captured by icon for a quick reference-great if you’re too lazy to read Online or Call Forwarding. You can set your own status as well, whether you use one of the standard, preloaded ones or one of your own. Any changes you make on Skype takes about 15 minutes to see through IM+ Talk, so don’t expect to be instantaneously viewing any edits you make. Now keep in mind that you don’t necessarily have to connect via Wi-Fi in order to connect with people on Skype- IM+ Talk does allow you to connect over EDGE/3G. So long as you have a fairly decent data plan, you should be okay. In Idle mode, IM+ Talk does use 5kb per hour. The way calls work through the app, is called half-duplex mode. This means that you need to be mindful, similar to a walkie-talkie, of switching between talk and listen modes. Additionally, IM+ makes use of the callback feature – meaning that you, as well as your contact receive an incoming call from Skype. You can also send out Skype SMS. This starts getting into Skype rates, which can be found here. IM+ Talk supports conference calls with up to 9 participants-perfect for conference calls on the go. A more frugal approach is the free instant messaging option you can use to reach out to your Skype contacts. This works just like any other instant messaging application, including file sharing. While not all the options are easily accessible, the functions that work, work well. The app would cause my Torch to freeze at times (like when asking for my permission to record media). Other times, it would become unresponsive. This definitely holds it back from becoming an effective alternate way of using Skype. This only happens when trying to test call capabilities or make calls. Another cause of concern is the price tag attached to the application – this rings up as $29.95. 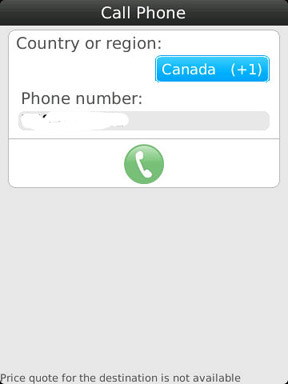 While Skype to Skype calls are free, you still have to follow Skype rates for other calls/sms. A price drop may help make this more attractive to users trying to decide whether it’s for them.